In the fall of 2010, The Mountaineers launched our Mountain Workshops Program — a program that partners with local youth-serving agencies to teach kids outdoor skills and give them meaningful outdoor experiences. Our first-ever Mountain Workshop was with the John Muir Elementary School fifth grade. The program had three parts: our volunteers visited the school, the kids came to the Seattle Program Center to climb, and we all met one last time at Seward Park to spend the day exploring outside and working on a stewardship project with Seattle Audubon. The program was a great success. The volunteers, kids, teachers, and staff all came away hoping to expand on the positive experiences in the future. Also in 2010, Seattle Parks’ Camp Long was invited to apply for a Department of Neighborhoods Grant to fund the construction of a ropes course. Designed to bring together youth from the surrounding communities in an outdoor setting, the potential for partnership was clear, and The Mountaineers jumped on board as partners in the grant with Camp Long. The Mountaineers have a long history of partnering with Camp Long, starting with Clark Schurman, a Mountaineer who built the climbing rock in 1939 to provide climbing training for both youth and adults in the community. Over the years, Mountaineers have used Camp Long to train Basic Alpine Climbing students in rock and glacier travel. From the first John Muir program, we had a vision of incorporating meaningful teamwork and opportunities to climb real rock into our Mountain Workshops. The Mountaineers now hosts more than 100 Mountain Workshops annually with more than 30 partnering agencies. We have also expanded our Mountain Workshop programming to include time on the ropes course and climbing rock at Camp Long. 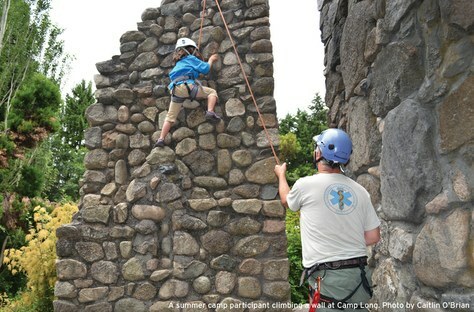 Last year, we added a day at Camp Long to our John Muir program, giving the kids an opportunity to work together on the ropes course and climb Schurman Rock. Because The Mountaineers and Camp Long have parallel missions — to give kids in the community meaningful outdoor experiences — we are able to multiply our impact, working together to give more kids more opportunities. Last year, we deepened our relationship with Camp Long — partnering to provide five-part holistic outdoor experiences for Seattle World School and Interagency High School. Youth in these programs learn teamwork and self-reflection skills on the challenge course, learn to climb and belay at The Mountaineers, challenge themselves and support one another on the High Ropes Course, and finish with a day of rock climbing in North Bend with volunteers from The Mountaineers and Camp Long. We are proud to continue this legacy we began in the 1930’s. Thanks in part to our partnership with Camp Long, we have the opportunity to connect with agencies throughout Seattle to bring youth from various communities together in a natural setting to learn about themselves and the outdoors. This article originally appeared in our May/June 2014 issue of Mountaineer magazine. To view the original article in magazine form and read more stories from our bi-monthly publication, click here.